This article describes how music came back into my life — again — and the process of recording my new album with some of Sweden’s leading musicians. The album is to be released later this year (2013) . My real answer, of course, is more complicated (as is Lester’s). It has to do with maintaining a long-term perspective, seeing the positive developments that have unfolded over decades, enjoying the “now” of the work in terms of human companionship and the pleasure of learning, and a deep commitment to family. But lately, I’ve decided to change my snappy two-word answer back to one word. As I wrote in my book Believing Cassandra, music came back into my life out of emotional necessity. I spent much of my 20’s working as a professional musician, performing in the rock and folk clubs of New York. Then I changed career tracks, and became a sustainability expert. But my early professional plunge into issues such as climate change, poverty, oppression, and biodiversity loss (starting in 1988) stirred up some strong emotions. Writing songs, starting with the dark comedy song “Dead Planet Blues,” helped me to express those emotions and deal with them … and probably helped me avoid drinking too much whiskey. But music is, of course, its own pleasure. It has its own purpose, quite separate from any personal or global agenda we bring to it. I have been reminded about this while working on my new album over the past year and a half. The songs on this album were written during the past decade, and some of them are deeply personal. For the first part of the project — which involved just me and my guitar, showing up at the studio once every couple of months — I just focused on the songs as songs. They are each different, ranging from up-tempo acoustic-rock to whispery ballads. After each recording session, I was happy just hearing the sounds of my beautiful Taylor acoustic guitar, captured on the rough mix tapes. But in the past few months, it has been the turn of other Stockholm-based musicians to come in and add their sounds, talents and interpretations to my basic picking, strumming, and singing. And Andreas Bauman, who has been helping me produce the album in his studio, brought in some great musicians. First there was Micke Ajax, an exceptionally sensitive percussionist, who read the mood and rhythm of each song perfectly and gave them a wonderfully compelling beat. Mats Nilsson, playing together with Micke, laid down rich, melodic bass lines … and suddenly the songs also had groove. Then last week came Tobias “Tobbe” Fall, who plays guitar with Sweden’s truly top singers (like Tommy Körberg and the popular summer TV show Allsång på Skansen, where nearly every current Swedish pop artist shows up during the summer). Tobbe brought five or six guitars with him, each of which seemed able to produce ten or more unique sounds. But most of all, Tobbe brought his extraordinary musicality, virtuosity, and a genuine engagement with the material. He and Andreas (who is also a keyboardist, with an excellent sense for musical ideas) worked together like artist and architect, bouncing ideas back and forth for sound, mood, phrasing … which Tobbe would then execute perfectly. For me, listening, adding my own requests and ideas, occasionally pulling out my own guitar to play a bit with Tobbe so he could quickly see which chord voicings I was using, it was just a joy. It wasn’t just the joy of hearing my songs come to life in the hands of musical masters. It was the joy of music itself. It was the pleasure of watching Micke and Mats have a musical conversation based on backbeats and melodic bass lines. It was the thrill of watching Tobbe rip off several killer electric guitar solos in the space of five minutes, just after laying down beautiful ringing tones on his aquatic-sounding baritone guitar. I confess I had forgotten just what joy listening to music can be. My own music listening habits were nearly atrophied. The joy of family life more than filled my non-work time. Music was something I still did … but really didn’t know what to do with (as I wrote here last year). 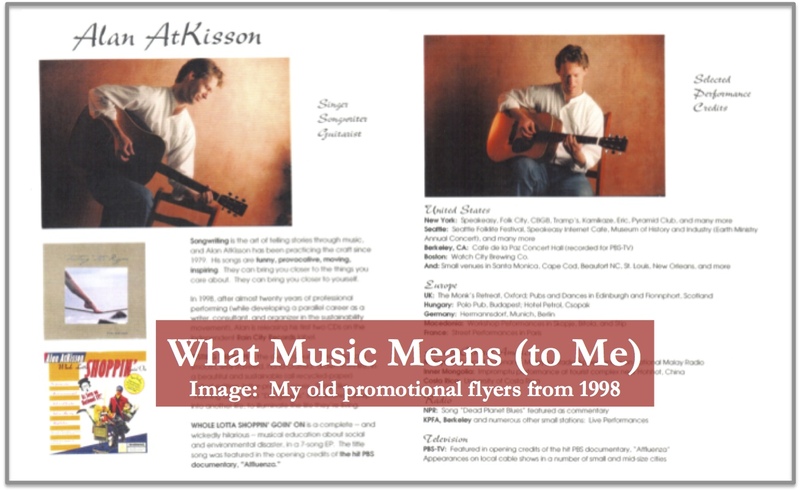 I still sang sometimes in my presentations, as anyone reading this probably knows; but I didn’t go to many concerts, except for my daughters’ piano and violin performances (plenty of joy there, too). I didn’t listen to my CD’s, or explore music online so very much. My musical life was far from dead; I enjoyed listening to what my children listened to, as they graduated from kids’ songs to current Swedish pop. But my music ears were pretty far from being fully alive, too. Actually, two things have happened to change that. First, my recent experiences in the studio sent me back into my CD collection and got me pulling out my guitar more often, just to play it. They got me surfing through the unending world of online music. They helped me rediscover the simple pleasure of listening to a well-crafted song or a virtuoso guitar piece. Secondly, I was approached out of the blue by the new Swedish organization, Performing Artists for the Environment (Artister för Miljön). Sweden’s former top TV meteorologist, Pär Holmgren (who is now a full-time environmental communicator), started AfM with friends, and invited me to get involved … as an artist. Since I also work as a consultant to the UN, an advisor to the EU, and other similar roles, I am sometimes careful about also identifying myself as an “artist”, to the point of occasionally hiding the fact. Why? Because I sometimes run into people in positions of authority who find it difficult to accept that one can be a serious consultant if one is also a serious musician. But Pär’s invitation spoke specifically to the more integrated artistic-professional life that I used to champion more actively. The afternoon in March that I spent with other performing artists — some of whom were learning about the real gravity of global environment challenges for the first time — was inspiring and refreshing. And as a benefit, because Pär and his colleagues had reminded me that I was indeed a performing artist, I began to see myself as one again. Which was good timing, because soon, I will have a new album ready to launch. Thanks to Andreas and the musicians who have enriched it, it will be an album that one can listen to because one likes the lyrics and the messages and the stories in the songs … but also just because one likes the music, the way it sounds. So now I wish to publicly thank Andreas, Micke, Mats, Tobbe, Mats Ronander (a Swedish music star, who plays a mean harmonica on one of my songs), and the other musicians still to come to Andreas’s studio, as well as Pär Holmgren and his colleagues at AfM, for reminding me what music means. For reminding me that music is … music. Its own joy. For reminding me that being a musician is a joy. For reminding me that being a musician and songwriter who also seeks to support the great changes happening in our world in the name of sustainability, using every tool and talent one has — that this, too, is a joy, and an unending source of optimism. And it’s much, much better than whiskey.